Have you ever wanted Short Cut to support more sensors? Although Short Cut supports many sensors, you may have found that the sensor you want to measure is not on the list. What do you do then? How do you add that sensor to your data logger program? 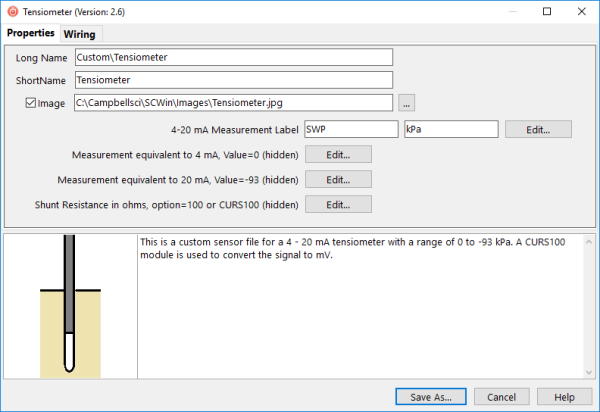 In this article, we’ll discuss how you can easily create your own custom sensor files in Short Cut for use in your programs. The Short Cut Program Generator is a software tool to help novices and experts create data logger programs in five easy steps. As an added benefit, Short Cut also creates for you a printable wiring diagram. Short Cut comes bundled with LoggerNet and PC400 software. You can also download the tool free of charge from the Short Cut download page. The content of this article assumes that you are already familiar with the five steps to create a data logger program using Short Cut and that you are ready to create your own custom sensor file. If you’re fairly new to Short Cut, you can learn the basics by watching the videos on the Short Cut web page. Short Cut has a Sensors folder titled “Generic Measurements” with several different types of measurements. If you know what type of output your sensor has, you may be able to use one of these generic measurements—especially if you will only be programming for that sensor once. Generic measurements, however, are probably not the best choice when you have a sensor that you use often and you don’t want to edit the generic measurement every time you use the sensor. If you create a custom sensor, it will save you time and effort later. 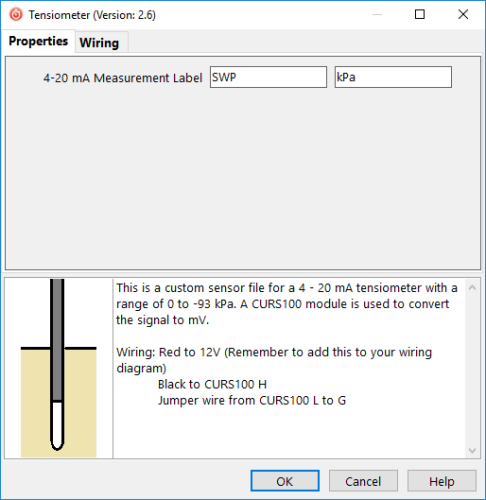 You have a favorite tensiometer that you often connect to a CR1000 datalogger to measure soil water potential. From the manufacturer’s specification sheet, you know that the tensiometer output is a 4 to 20 mA signal and that its measurement range is 0 to -93 kPa. From the tensiometer manual and past experience, you know that the tensiometer requires 12 to 24 Vdc for power and that it has a red power lead and a black signal lead. Because the CR1000 measures voltage instead of current, you will need to use a precision shunt resistor of 100 Ω or 125 Ω. The CURS100 100 Ohm Current Terminal Input Module, available from Campbell Scientific, can convert the 4 to 20 mA signal to a 400 to 2000 mV signal that the CR1000 can measure. With Short Cut running, the first step to create a custom sensor is to select Tools | Options from the menu at the top of the screen. In the Options dialog box that opens, select the Enable Creation of Custom Sensor Files checkbox, and select the OK button. In Short Cut, go to the New/Open screen, and select the Create New Program button. This takes you to the Datalogger screen. 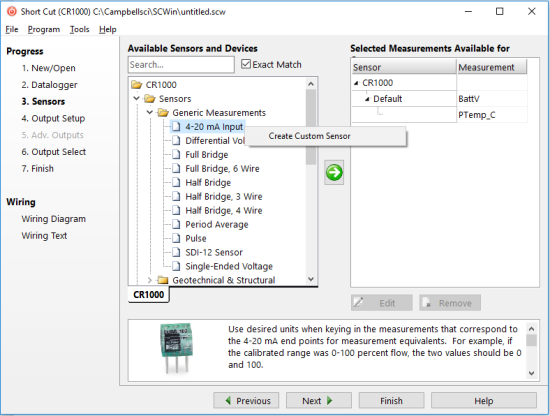 In the Datalogger Model field, select the CR1000. Select the Next button. On the Sensors screen, in the Available Sensors and Devices field, right-click the desired sensor. If there is a sensor on the list that is very similar to yours, select that one. 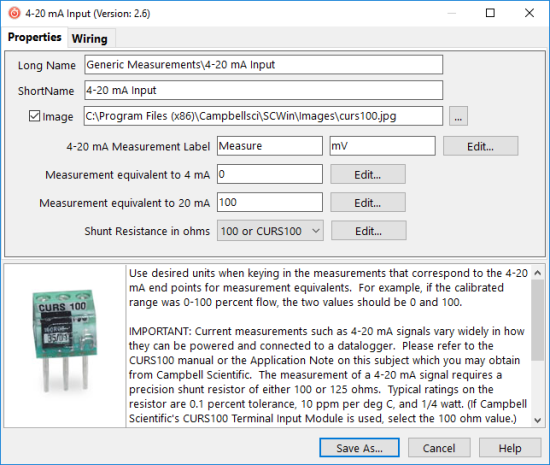 In the Generic Measurements subfolder, select 4-20 mA Input. Right-click 4-20 mA Input, and select Create Custom Sensor. A custom sensor dialog box opens where you can make edits to create your sensor. Use the Long Name field to create a pathway to the sensor in the Available Sensors and Devices field. In the ShortName field, type the name that Short Cut will show for your custom sensor. If you have an image of the sensor on your computer, you can specify a pathway to it. Ensure that the Image checkbox is selected, and use the browse button to add the image file’s location. The other editable fields on the Properties tab provide Short Cut with the information it needs to generate the correct CRBasic code. For each field that you edit, select or deselect the Visible to User checkbox. Tip: You can use this checkbox to hide values if you don’t expect they will ever change. At the bottom of the custom sensor dialog box, in the large notes field with a scrollbar, you can type in your own description and notes. In this example, the Long Name field creates a new folder titled “Custom” where the new sensor will be found the next time you want to use it in a CR1000 program. To customize the sensor wiring, select the Wiring tab. Select the wire caption (such as High or Low) to open the Wire Properties dialog box. In this box, you can change the caption and wire color to match your sensor. If you find that you cannot enter some information you would like to on the Wiring tab, type it in the notes field at the bottom. For our example, it’s not possible in the Wiring tab to add the red power lead and specify that it connects to 12V, so that information is entered in the notes field instead. When you finish editing the custom sensor file, select the Save As button. By default, the file is saved to your Campbellsci working directory (C:\Campbellsci\SCWin\sensors) with a file extension of .SCU. Tip: It is good practice to save the images you use for custom sensors to C:\Campbellsci\SCWin\Images. Because some of the fields were hidden from view, the only editable items in this window are the sensor name and the measurement units. 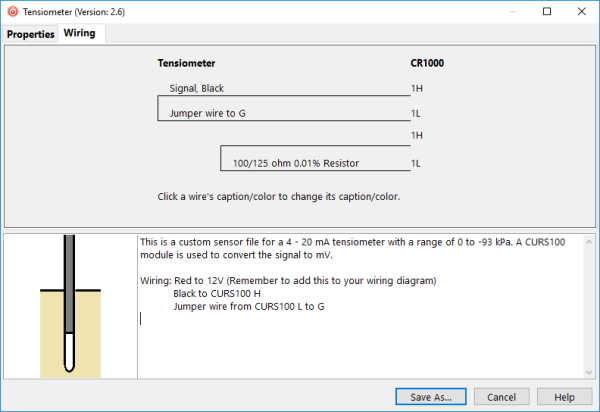 Note: If you want to use your custom sensor on other data logger models, you will have to repeat the steps outlined here. In Short Cut, be sure to select a different data logger. 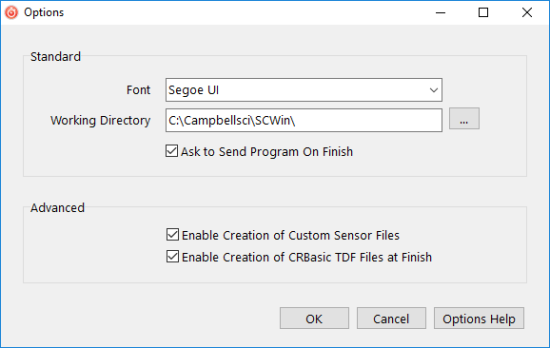 Tip: Regularly make a backup of your Campbellsci working directory to preserve all of your custom sensor files, data logger programs, and especially your data logger data. 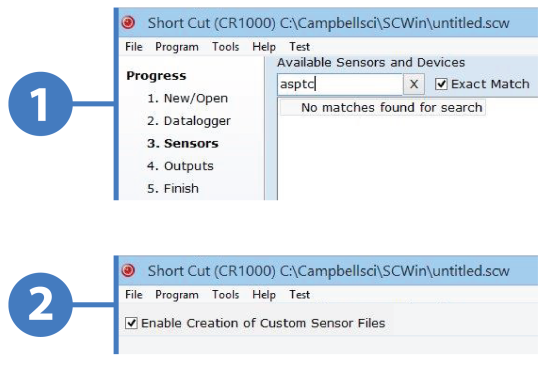 When you create custom sensor files in Short Cut, you enable this tool to more effectively help you create data logger programs. With a little bit of practice, you can add a whole suite of non-standard sensors to Short Cut and create data logger programs and wiring diagrams faster than ever. If you have any custom sensor programming questions, post them below.